US concerns that the UK was struggling to cope with home-grown extremism have been revealed in new Wikileaks cables. One cable said the British government made "little progress" in engaging with the UK's Muslim community after the 7 July 2005 terror attacks in London. The communication was delivered to Washington from the American embassy in London in August 2006. 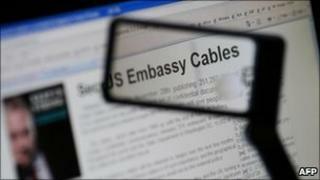 The cable said tensions continued, with some British Muslims blaming UK foreign policy for inciting extremism. Meanwhile, Wikileaks founder Julian Assange, who is currently in prison in London, has defended the release of the cables in a statement issued via his mother Christine. Read on Australian television station Channel 7, it said: "My convictions are unfaltering. I remain true to the ideals I have expressed." Mr Assange also branded Visa, Mastercard and PayPal "instruments of US foreign policy" after they blocked donations to the Wikileaks website, adding that he was "calling on the world to protect my work and my people from these illegal and immoral acts". He is due to appear in court in London on Tuesday to fight extradition to Sweden where he denies sexually assaulting two women. The document concerning UK extremists, details of which appear in the Guardian newspaper, was sent shortly after the publication of an open letter highly critical of British government policy signed by prominent Muslims, including Labour MP Sadiq Khan, who is now shadow justice secretary. The cable referred to anger among some British Muslims about issues such as the arrest of suspects over the failed transatlantic airliner bomb plot and then Prime Minister Tony Blair's failure to call for a ceasefire after Israel's assault on Lebanon. It said: "Since 7/7, HMG [Her Majesty's Government] has invested considerable time and resources in engaging the British Muslim community. The current tensions demonstrate just how little progress has been made. "At the same time, the Muslim community's reaction to the arrests of 24 of its own sons - a knee-jerk reaction blaming HMG - shows that its leaders too have far to go. "That said, the Muslim community is not the only element in Britain blaming HMG's foreign policy for inciting radical elements; the left in particular but even the mainstream press has expressed the belief, reportedly widespread, that home-grown terrorism is an 'inevitable' response to the UK's involvement in Iraq and reluctance to call for an 'immediate ceasefire' in the Middle East." In another of the leaked documents, a US diplomat in Kenya expressed the concern that a change of government in the 2010 UK general election would result in ministers with a "simplistic point of view" over terrorism. The message was sent after a counter-terrorism meeting between British and American officials in the Ethiopian capital Addis Ababa in October 2009. In a separate leak of cables also published on Tuesday, a US diplomat in Portugal said UK police helped "develop" evidence against Madeleine McCann's parents. Wikileaks has released a series of US diplomatic cables that have appeared in the Guardian and several other newspapers around the world.